Out-of-wedlock childbirth has soared worldwide since the 1960s, and many governments struggle to respond. Of the world’s 140 million births that happened in 2016, about 15 percent – or 21 million – were born out of wedlock. This global average, however, does not reflect the enormous variation in the proportion of births outside of marriage across countries and regions. At one extreme are some 25 countries, including China, India and most countries in North Africa and Western and Southern Asia, where the proportion of births out of wedlock is low, typically less than 1 percent. In those societies births outside of marriage carry strong social disapproval, including sanctions, penalties and punishments to the mother and father as well as stigmatization of the child. Some travel guides advise couples to pretend to be married. In striking contrast, the proportions of births outside marriage in another 25 countries mostly in Latin America, including Brazil, Chile, Costa Rica, Jamaica, Mexico and Colombia, are estimated at more than 60 percent. In another 20 countries, including Belgium, Denmark, France, Norway and Sweden, the majority of births occur outside marriage, with government assistance typically provided to single mothers. Marriage has become less necessary for women’s financial survival, social interaction and personal wellbeing, and government policies have been slow to keep pace. Like it or not, out-of-wedlock births are in transition worldwide and create challenges for many societies. Increasingly single women and cohabiting couples, especially in Western societies, elect to have children and raise them outside the institution of marriage. In many countries, marriage is no longer viewed as the only acceptable institution for childbearing and long-term intimate relationships. The high incidence of childbearing out of wedlock is a relatively recent phenomenon. The proportions of such births a half century ago were substantially lower than today. For example, in 1964 most countries in the Organisation of Economic and Co-operative Development had no more than 10 percent of their births outside of marriage. By 2014 in only five countries – Greece, Israel, Japan, South Korea and Turkey – were the proportions of births out of wedlock below 10 percent. In the large majority of more developed countries, including Germany, the United Kingdom and the United States, more than one-third of all births take place out of wedlock. Again, national averages do not reflect the considerable variation in non-marital childbearing within countries. 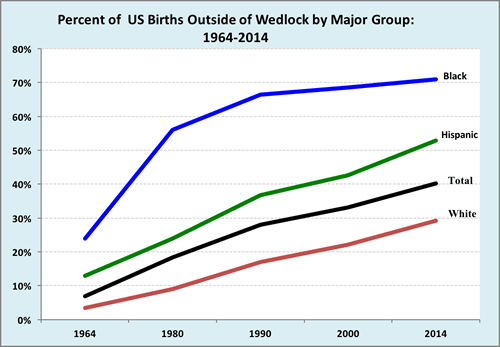 In the United States, for example, significant differences in out- of-wedlock births exist among major social groups. While the national average for the United States in 2014 is 40 percent, the proportions of births out of wedlock for whites are 29 percent; Hispanics, 53 percent; and blacks, 71 percent. The proportions of such births for those groups were lower 50 years ago. Many of the children born out of wedlock live in single-parent households, typically headed by single mothers. 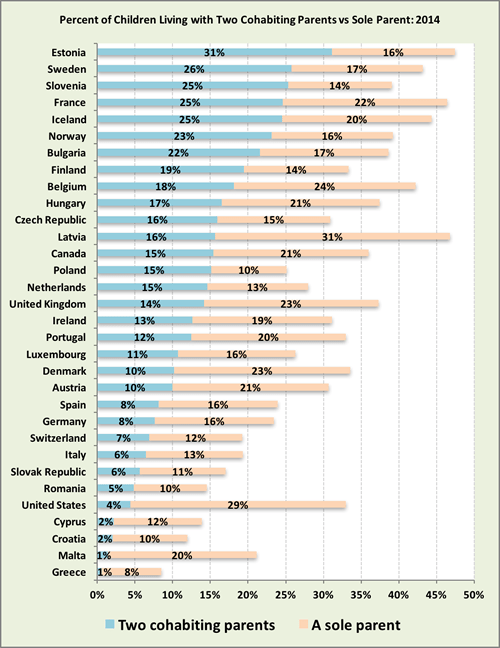 The proportions of children living in single-parent households vary considerably across countries. At the lowest levels where 10 percent or less of the children live in single-parent families are three dozen mainly developing countries, including China, India, Indonesia, Israel, Jordan and Turkey. And high levels of single-parent families are found in Latin Africa countries where close to 40 percent of the children live with mothers only and about 4 percent live with fathers only. Other countries with high levels of children in sole-parent households – typically a single mother – include Mozambique, 36 percent; Dominican Republic, 35 percent; Liberia, 31 percent; and Kenya, 30 percent. Over the past several decades the incidence of single-parent families has generally increased worldwide, with the largest increases in industrialized countries. Between 1980 and 2005, for example, the proportion of single-parent households doubled for many developed countries, including France, Japan, Sweden, the United Kingdom and the United States. Note, a woman having a non-marital birth does not necessarily translate into a single-parent household. Often non-marital births occur to cohabiting couples, who increasingly choose to continue cohabiting rather than marry. 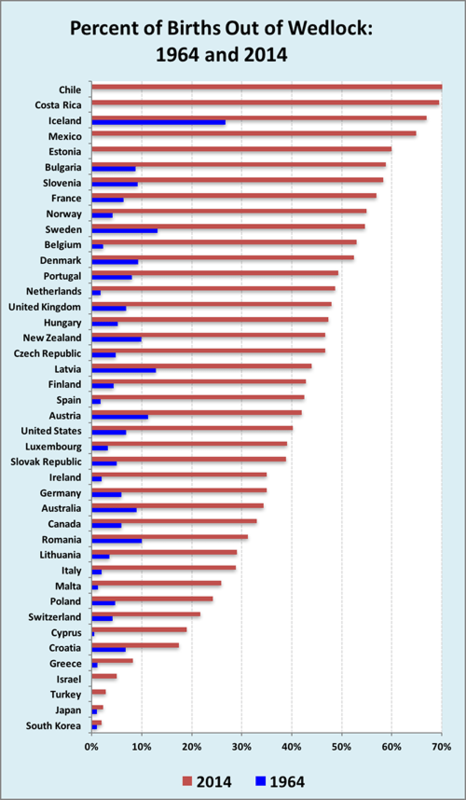 Among OECD countries, children living with two cohabiting parents are increasingly common. While the average OECD proportion of children living with two married parents declined from 72 to 67 percent between 2005 and 2014, the proportion living with cohabiting parents increased from 10 to 15 percent over that decade. The highest proportions are observed in five countries – Estonia, France, Iceland, Slovenia and Sweden – where one quarter of the children are living with cohabiting parents. And in Austria, Canada, Denmark, Hungary, the United Kingdom and the United States, more than one fifth of the children live with a sole parent, which substantially exceeds the proportion of children with cohabiting parents. Reasons vary for the growing preference of many young couples to cohabit rather than marriage. In many countries, both developed and developing, cohabitation does not carry the same stigma or social taboo as in the past, especially in urban areas with the relative anonymity and tolerance of diversity. Cohabitation permits women and men to explore living with a partner in an intimate relationship. Rather than review hypotheticals, couples try the arrangement and assess for themselves whether they are willing make a long-term commitment. Cohabiting allows individuals to test compatibility with a partner while keeping options open. In the United States most women who marry for the first time cohabit first. Also in China growing numbers of couples are cohabiting before marriage, with surveys finding that approximately 60 percent of those born in the 1980s had lived together before marriage. Even in Iran increasing numbers of young couples in urban centers are living together, locally called “White Marriages” because their marriage status page is left blank in their national identification certificates. Young couples are aware of divorce statistics and consequences of divorce, even without children involved, and for many, cohabitation is a hedge against divorce. In addition to escaping costly wedding expenses, cohabiting couples avoid the legal complications, family entanglements, emotional stress and financial costs associated with divorce proceedings. With their changing roles and status in society, especially at the workplace, women have become more economically and socially independent. Also, with the availability of modern birth control methods, women have gained control over reproduction. Worldwide women now outnumber men in both university attendance and graduation. Nevertheless, marriage continues to have clear advantages over cohabitation in most countries. Married couples receive many legal and economic benefits not available to unmarried couples. The United States offers more than 1000 benefits.. For example, being married by and large means a spouse has the legal right to receive property settlements, visitation rights, travel benefits, tax breaks as well as financial support if divorce occurs. Also, in the event of death, marriage generally entitles the surviving spouse to the couple’s property and wealth, including survivor’s benefits from retirement and pension schemes. Various groups and organizations, including many religious institutions, have expressed serious concerns with some pressing for restrictive policies to the growing incidence and acceptance of out of wedlock births. They consider the decoupling of sexual relations and procreation from marriage as a serious problem undermining the institution of marriage, the centrality of the family for childrearing and the overall stability and wellbeing of society. While some countries have recognized the significant changes in childbearing and marriage over the past half-century, they continue to struggle on how to address the consequences. Most traditional countries in Asia and North Africa continue to consider out-of-wedlock births and cohabitation as totally unacceptable behavior. Other countries are gradually taking steps to loosen their laws and programs to the new realities. Irrespective of the views and government policies, in too many instances the children born out of wedlock are disadvantaged and fail to receive the necessary protections, support and assistance to ensure their health, development and wellbeing. Unfortunately, this challenge, too often ignored to the detriment of the children, communities and countries, must be addressed.